Many people have just gone back to school this month after a summer of growth and learning. 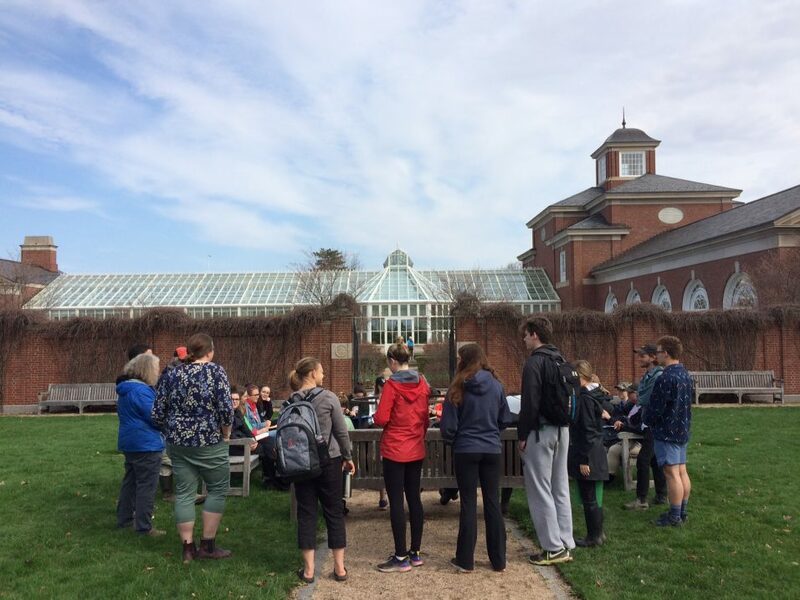 The Botanical Gardens supports many educational opportunities both formal and informal in our outdoor classroom 365 days a year. The classroom here has no walls or roof, it is everywhere, and the teacher is the natural world. I feel so fortunate to work outside in an environment where there are so many lessons to be learned and new skills to acquire. Every day as I walk in the woods or garden, I see something that I don’t recognize or understand which strikes my curiosity and results in research and inquiry. I have always been a self-directed learner as I didn’t attend formal schooling until grade 9. As a child I would commonly be asked, especially this time of the year, how I would learn anything if I didn’t go to school. It always struck me as an odd question as I didn’t have the experience of learning in school to know what it was like, but I certainly knew that I was acquiring new skills and knowledge at a rapid pace. My experience had always been learning from elders, friends, books, and from the world around me. It was a great and organic style of learning that left me curious and self-sufficient and resulted in me loving learning and wanting to study. In my somewhat free-range childhood I didn’t experience a stop or start to my education based on the season or time of day, it was an ongoing ever-evolving process and it still is today. It’s always a pleasure to be able to share my love of learning with others and each season I get the opportunity to do this at the garden through coaching our summer students. It’s great to see how much learning happens in 4 short months as the students acquire new job and life skills and gain confidence. Our summer students learn about ecology, native plants, and ecosystems while also acquiring knowledge of team building, occupational health and safety and much more. They also experience the joys of getting their hands dirty and the satisfaction of putting in a hard day’s work. Most students at the end of the season go back to their indoor classrooms and books with a greater understanding of the natural world and themselves. If you’re hitting the books this fall and attending school, please remember to stay open to learning using the great outdoors as your teacher. Balance your studying with long walks in the woods where you pay attention to the sights, sounds and smells around you. Ask questions and keep an inquiring mind and don’t forget to leave space for doing nothing. It’s hard for our brains to absorb new information if we don’t allow time for rest and reflection. Some of my most creative and best ideas come from lying on the grass staring at the sky or walking in the woods. Give yourself permission to just ‘be’ and trust that learning will happen. You don’t have to step very far into our 6-acre native plant garden before learning opportunities arise. If you’re new to the area or you haven’t yet explored the garden, we are open to the public daily from dawn to dusk and we have lots of natural spaces for learning and reflection.